And that’s the key, the vast majority of both in-store and online offers require the use of personalized promo code that each customer receives in their emails every time Fry’s runs a promotion. So if you are interested in most of these offers, make sure you sign up for their emailing list. SPOILERS below if you want to guess on your own, or if you want to surprised in store. 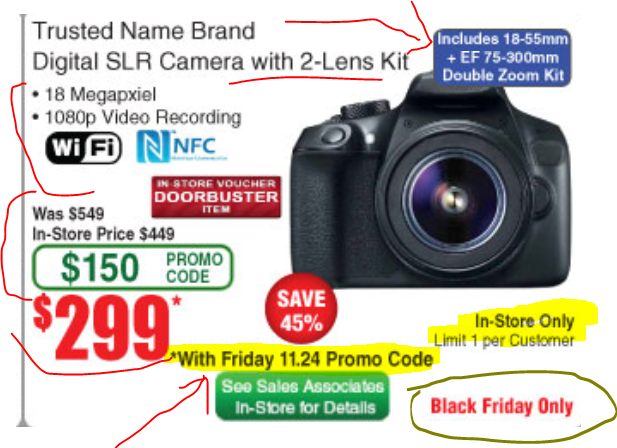 It is most likely the Canon D-Rebel T6 with 18-55 and 75-300 which is an official Black Friday deal for $450 at various B&M dealers that have already posted their ad. It matches the $450 price, along with the 1080p and Wifi and 18-megapixels and NFC. As you can see from the ad, this will be offered on Black Friday only, at their brick and mortar stores only, with one per customer. You need to have your personal promo code from the Fry’s email newsletter of that day.